Dodos? Mammoths? Quaggas? Oh, my. 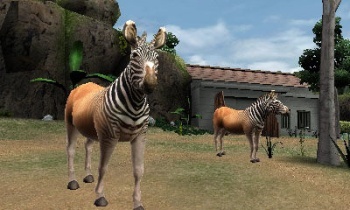 Marvelous Entertainment's upcoming zoo sim for the 3DS, Animal Resort, is reportedly pretty dang cute. It's got penguins and polar bears and pandas, but now it turns out that the game is going to features a number of extinct species, too. The title is set to include roughly 100 species of animals, but Marvelous has revealed that some of these animals have been long dead. According to Andriasang, animals like dodo birds, wooly mammoths, and quaggas (an extinct subspecies of plains zebra) will make an appearance in the title. If you haven't heard about the game before now, here's a quick summary. Players start off inheriting a defunct zoo from their grandfather and reopening it with only a single elephant to show off to the public. From there, they have to rebuild the zoo's animal population and keep them happy so visitors will enjoy watching them in their habitats. Animal Resort is currently scheduled to be released in Japan on May 19th, with a North American and European release "soon after."